Each week, we will post a new suggestion for saving energy, water, and generally living more lightly on the Earth. These are also available in Spanish on this website. Our thanks go to an Eco-minded parishioner in Mary Immaculate Parish, Pacoima, California for these Eco-Tips. Cigarette butts, snack wrappers, take-out boxes, and drink containers are our most common liter. Each one can hurt animals in a different way. Little animals like squirrels and skunks sometimes stick their heads in small plastic containers (especially yogurt containers) trying to get the food that’s left, and get stuck there. Deer and other animals often cut their tongues on half-opened cans. Six-pack rings can trap and strangle birds, fish, and other animals. Animals mistake cigarette butts which are made of plastic and eat them, which can kill them. So, when you go hiking take a trash bag to collect your trash and other trash along the way. The animals from the forest will greatly appreciate it. Do you want to save trees – and money – at the same time? Check out the blog “These Come From Trees” – which describes itself as “An experiment in environmentalism, viral marketing, and user interface design with the goal of reducing consumer waste paper! 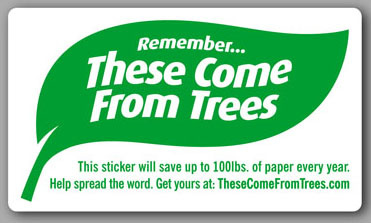 A single “These Come From Trees” sticker can save roughly a tree’s worth of paper, each year! The project has indeed gone viral, with stickers appearing everywhere from the Denver airport to Seton Hall University. Schools can order them for free, and the project has developed a simple lesson plan which guides students through calculations of paper and money saved. Order your “These Come from Trees” stickers today! Pack your presents in ordinary gift wrapping. Be creative. Use newspaper or colorful pages from magazines and hang them a Christmas ornament. You can also pack presents in a beautiful scarf and make the packaging part of the present. As we enter the holiday season, consumers flock to malls, department stores and outlets in droves to search for that perfect gift, that one card that says it all, that tree to end all trees. But as we feast, give gifts, decorate and travel, we also consume lots of resources and generate lots of waste. A recent report noted that the amount of household garbage in the United States generally increases by 25 percent between Thanksgiving and New Year’s Day, from 4 million tons to 5 million tons. Think about what you can do to stop the impact of the holidays on earth. Decorate with more energy efficient LEDs (light emitting diodes) strings rather than the larger, old fashioned lights. And be sure to turn them on only when someone’s around to appreciate them. Wrap gifts using old newspapers or paper bags. Avoid foil and plastic-embossed paper because these use more resources in the manufacturing process. When you’re not enjoying a fire in your fireplace, close the flue and block the hearth to prevent heat loss. 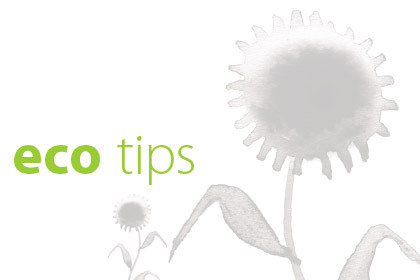 The holidays are here and we want to remind you of a few things you can do to stay green. Carpool when you go shopping. And most important don’t waste food. Save the plastic containers and jars from food you buy and use them to save food or take the leftovers from a restaurant. Rock yards and cactus are not the only solution to a water-wise landscape. Managing the amount of water used is also a factor. Some parts of the US – Arizona, for instance – receive very little rain each year; therefore people rely on municipal water for landscape plants and gardens. Selecting low water-use plants is important but managing what little rain falls can make a difference, too. Rainwater harvesting is the process of catching and storing rain or creating a path for the water to find its way to trees, plants, or gardens. Watch how water flows on a property during a rain storm. Direct it in to storage barrels or cisterns with gutters and use it later. Slow the flow on hills or slopes by creating a slight ditch (or row) on a contour to prevent soil erosion as well as to allow the water time to settle into the soil.